Also known by the title Canis Canem Edit, Bully is a controversial action game developed by Rockstar Games. Originally, it was released for PlayStation 2, it was soon followed by Scholarship Edition for the next generation of consoles and PCs. Bully: Scholarship Edition for PC, AND and etc. is an action game featuring arcade elements. It is a remake of 2006's Bully (in Europe, known as Canis Canem Edit) released for PlayStation 2. The original game was awarded many prizes, including the title of the Best Game of 2006. 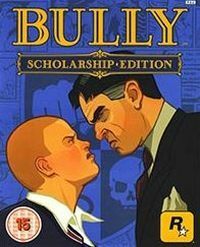 In Bully: Scholarship Edition for PC, AND and etc., the player assumes the role of Jimmy Hopkins - a fifteen-year-old disobedient boy who had been thrown out of many schools already. This time, he ends up in Bullworth Academy, where his goals are to survive and gain some popularity in the new community. The player is required to overcome traditional difficulties experienced by regular teenagers. Completing the main storyline takes about twenty hours, but in order to achieve a hundred per cent completion, twenty more are required. Bully: Scholarship Edition for PC, AND and etc. is played from the third person perspective. The protagonist attends classes, the number of which was increased in the Scholarship Edition - four new subjects were added, including maths, biology, music and geography. Each subject is represented by a different mini-game. For instance, the player is required to mix different ingredients together to produce a given compound during the chemistry classes; when it comes to biology, the player performs vivisections of animals with a scalpel and tweezers. On the other hand, during gym classes, the protagonist learns new combat moves. Between lessons, the player explores the school grounds and a neighboring town, completing very diversified assignments. By passing numerous bonus missions, the protagonist earns money. Furthermore, the player's actions combined with progression in the story unlock new clothes for Jimmy to wear and different items and weapons he can use. The Scholarship Edition was enriched mainly with eight new missions interwoven with the original story. In one of them, Jimmy has to help a miserable fake Santa Claus while small elves are trying to interrupt. The virtual school is a living place. The player encounters both typical nerds and bullies. The player can talk to other students in order to make them like the protagonist, or conversely, the player can express their disapproval and terrorize others. The player's actions influence the way certain groups of students approach the protagonist. Making friends among the losers will not inspire the respect of the muscles, which works the other way around as well. Fighting is common here, but the player is required to do so in order to defend the weaker ones. The player unlocks more and more combat moves along the progression in the story. Obviously, fighting is never deadly here. At the end of a fight, the player performs a finishing move, which serves the role of a punishment and humiliation of the opponent defeated. Winning fights earns reputation in the school grounds, but one should remember that the place is a subject to certain rules. School corridors are patrolled by prefects and teachers who have to be avoided in case of being a truant. The game offers fully three-dimensional environments and character models. The creators placed a great emphasis on recreating the school life within a video game. When walking around the school, the player will not see duplicated faces and the students are similar to one another only because they wear school uniforms.